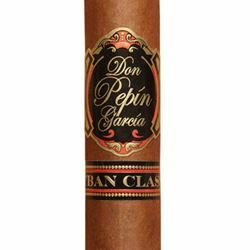 Don Pepin Garcia Cuban Classic is the newest member of the Trio of Don Pepin Cigars. This cigar is the first blend made in the Garcia's Factory located in Estela, Nicaragua. Hand made using a butternut-brown wrapper; these cigars are jam-packed with lush, hearty Nicaraguan tobaccos. The flavor is rich and robust, yet complex and refined. Tasting notes include wood, earth, cocoa and mixed nuts. It is a Medium to Full-Bodied cigar with an exquisitely flavored blend, in a premium ""Habano-Rosado"" wrapper and finished with their distinctive ""triple-cap"". It has an average rating of 92 points in Cigar Aficionado Magazine and has been included in the list of the Top 25 Best Cigars of the Year. It is packaged in a beautiful ""flip-top"" cedar box containing 20 cigars each.